Sukkot is a time when we welcome family and friends into the sukkah to celebrate and connect with one another. 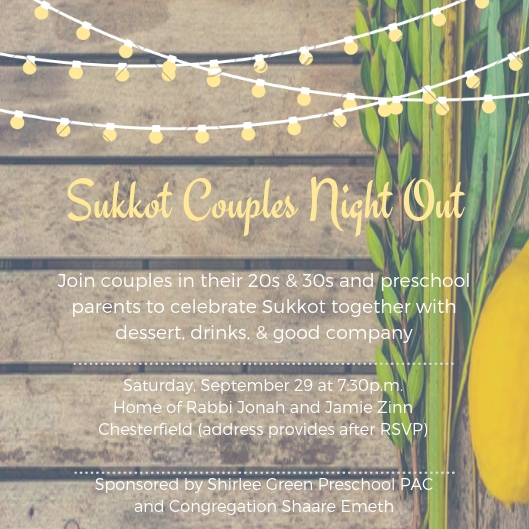 Join couples in their 20s & 30s and preschool parents to celebrate Sukkot together with dessert, drinks, & good company. We’ll gather together in the Sukkah to mark the end of Shabbat with havdallah and celebrate Sukkot as a community. Saturday, September 29 at 7:30p.m. All are welcome. Please invite any couples you think would be interested in this type of event.